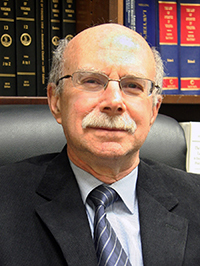 The Virginia State Bar Criminal Law Section has presented its 2014 Harry L. Carrico Professionalism Award to Gerald T. Zerkin. The award was presented on February 14, 2014, during the section’s 44th Annual Criminal Law Seminar in Williamsburg. The award was named for the former Virginia Supreme Court chief justice who promoted the ideals of professionalism during his forty-two years on the state’s highest court. Zerkin earned his bachelor’s degree from Brandeis University, has master’s degree from the University of Virginia, and his law degree from the Boston College Law School. He began his legal career in 1976 and in 2001 became senior litigator in the Office of the Federal Public Defender, with the responsibility for defending federal capital cases. Since 2008 Zerkin has been Capital Case Resource Counsel, Federal Death Penalty Resource Counsel Project of the Administrative Office of the United States Courts, where he provides advice and assistance to federal defender offices and court-appointed counsel defending federal capital cases. Zerkin has twice argued cases before the United State Supreme Court. He has made numerous presentations on criminal defense and capital punishment issues in Virginia and across the country.